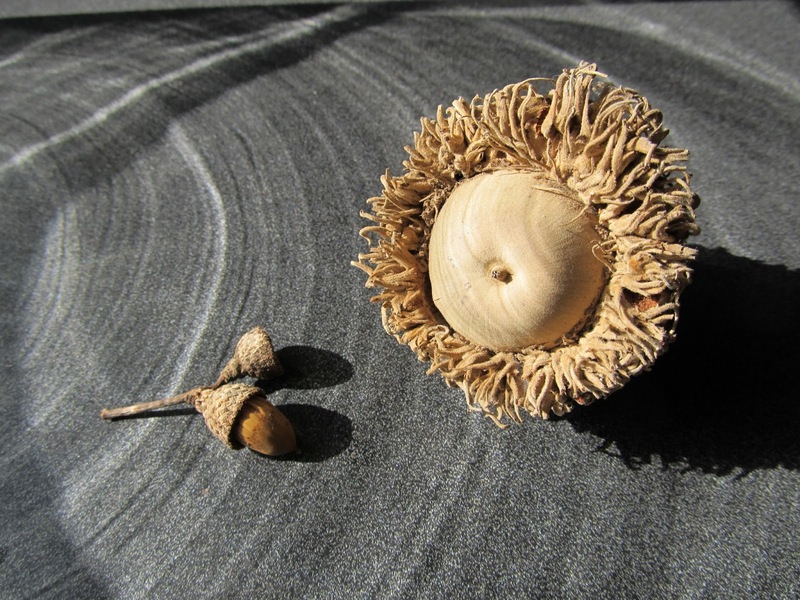 Also known as "Mossy Cup" because of its fringed cap, the acorn from the Quercus macrocarpa or Bur Oak is the largest native acorn in North America. This one measures 2.5 inches/6.35cm long and up to 2.75/7cm in diameter. Bur Oak trees are native to a belt which runs from Central Texas north to southern Canada and east to the Appalachians. 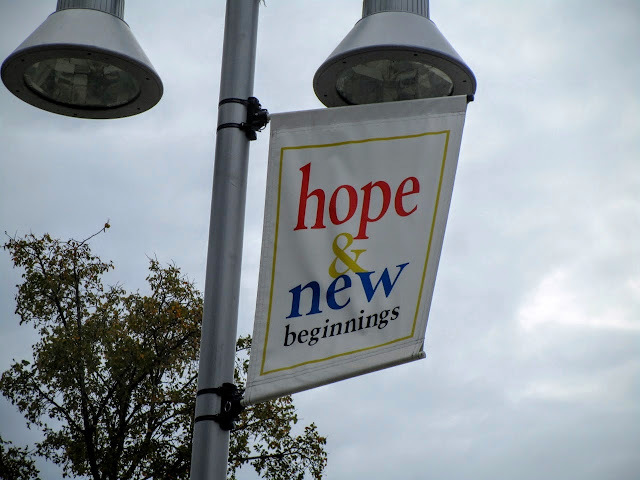 San Antonio is just on its western edge. Here's a shot with a live oak acorn from the yard for size comparison. 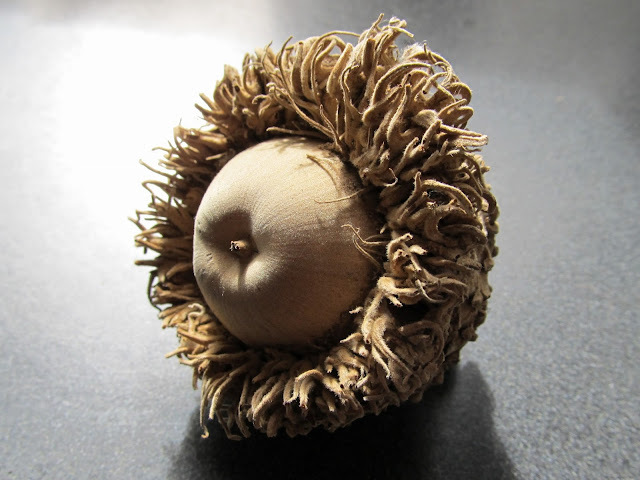 This Bur oak acorn was found on a golf course in San Antonio and I'd love to find more because I think they'd look great in a basket on the porch. I was wondering what the squirrels would do with them! I think I remember your post on the bur oak planting in your yard. Oaks take a while but are so worth it. I was taken to some in the San Angelo area, on the Concho River headwaters...macrocarpa = big fruit! Yes, it's a big acorn. San Angelo is a bit far and not listed as part of the Bur Oak range so that's interesting to know. They are around here, might be easier to spot in the spring. That range map also shows SA on the W edge and not far from the southern edge, so both of you SA's are on the western edge of the range! We are also in an island on some of the maps as if the range jumps over the area just east of us. They got some growin' right here in Tulsa OK! I just found five of those big nuts today! 4 with the lion's mane cap and one loose fellow that I showed to dozens of folks here that had no clue what they was lookin' at! Even Though I'm from East Texas, I'll be perfectly honest with you Folks, until I found it on this webpage, I didn't have a clue either. Oh come on! That can't be real, can it? I know everything in Texas is big, but this looks like something that got hit by a bolt of lightening! It's real but doesn't look it at first glance. Looks more like the cowardly lion. Yes! Exactly...and that's why I love it. It is pretty cute, a lion mane is a good image. I love acorns and that one is mammoth. Its fashionable headress is nice too. It us pretty cool, like a scarf from one of my favorite stores. Holy toledo! Man that would hurt if it fell on your head! Chicken little would have been knocked out! No but seriously.....I wouldn't want to plant one too close to the house (roof) or entertaining area. Wowzers! I'm not sure I would want one in the yard. When the little live oak acorns fall on the metal roof it makes such a clatter. I can only imagine that this one would make dents. I used to be a touring docent, at a historical park in Dallas. There is an old bur oak there. It's a gorgeous tree....huge and very old. I used to pick up some of those acorns to bring home and put in a bowl. Ricki's right....they do look like a lion. I'm on the lookout for more, I've even seen them for sale on etsy. Not cheap either. Definitely stunning, I've read that they have been planted in Europe though I'm not sure where. I know there are more around here, just need to find them. I've never seen these! What a gorgeous acorn! You are right - they would look fabulous in a basket. And no one would realize they were acorns! Very much of a "what is that" kind of thing. I had heard of them but not seen one in person before this. Don't want to park your car under them. They are a hard oak to fit into a design, as they are so coarse and need a large space. Nope and don't want them on my metal roof either. A Facebook friend mentioned she has to pick them up before mowing the lawn or it's lights out for the mower. Sounds like it's not the beauty an old live oak is. I thought as Greg did. Keep the cars away. WOW! Like coconuts in the tropics, don't want them over my driveway or sidewalk. Do you REALLY want to go to the golf course to look for more? Fruit would look lovely in the basket and with golf balls and those beauties flying around, it truly is the safest option. Wow! What a cool acorn! I've never seen one before so thanks for sharing!